My time for cross stitching is more limited on Monday nights because we spend time together as a family for Family Home Evening. We generally have a little devotional and have some kind of treat, although some times we play games together or do some other activity. Last night we talked about David and Goliath and how difficulties in our lives can either be stepping stones or stumbling blocks depending on the way that we react to them. I did get some time to stitch and I am pretty happy with what I was able to accomplish. 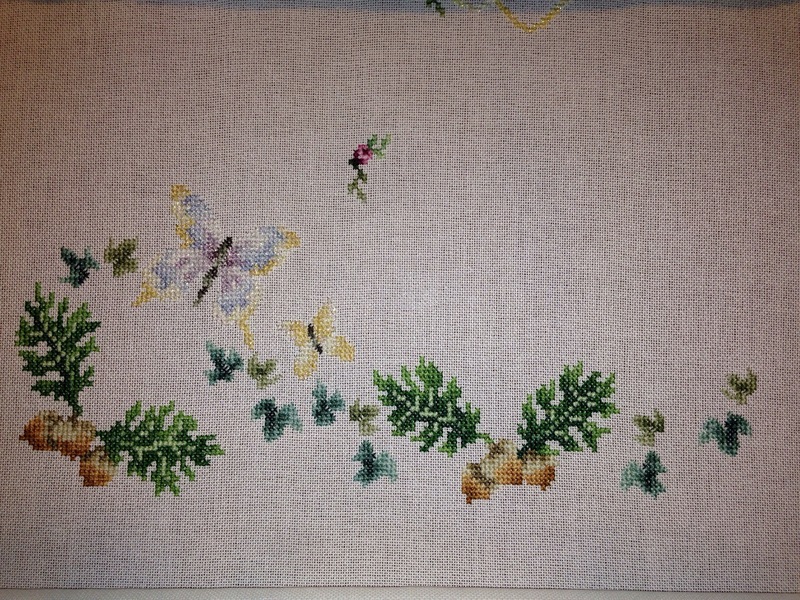 When I first started this piece I thought that the roses were rather tedious to stitch. I must be getting used to them because I really enjoyed stitching them through this diagonal. In the end I was able to put in four hundred stitches and made it down to the hat. This week I am working on Midsummer Roses by Paula Vaughan. I am getting close to the half-way mark on this piece and am really enjoying how it looks. When I start working on a piece I can’t help setting a little goal of what I would like to accomplish on it for that week. This time I am hoping to be able to hit the bottom right corner. That would be a great milestone to reach because when I reach that point I know that the diagonals are going to get shorter and that a finish is not far off. Last night I was able to put in three hundred stitches. I am working through the bouquet, which is the most complicated part of the design. The way that colors are distributed through the flowers makes it so that I am constantly threading and un-threading my needle as I stitch. I am used to working this way, but it does take a little longer to work through the pattern. I am looking forward to watching this grow this week. It has been a while since I have updated this blog. I have decided that I need to post monthly updates that correspond to the Floss Tube videos that I am posting on YouTube. I am going to start with a summary of what I have done stitching-wise in the last year. 2016 has been a good stitching year for me. I only finished three pieces, but as I look at my rotation, I have realized that I have made great progress and should have set things up for more finishes in 2017. I am going to take you through my current rotation to show you what I mean. I am actually quite happy with my progress, and am looking forward to seeing how much of this I will be able to stitch in the next year. I have finished three of the houses and am close to fini7shing the fourth. I am pretty sure that this will be one of the pieces that I finish next year. This has turned out to be a really fun piece to stitch. There is a lot of variety in the areas that I am stitching. My favorite part of the design is the lower right corner with Santa and the gingerbread man. I have finally reached the lower corner, which means that the diagonals that I am stitching are not getting any longer. After I stitch three or four more diagonals, I will reach the upper corner and then the diagonals will start to shrink again. I am excited to work on this more in 2017, although I am not sure if I will be able to finish it. This piece looks pretty complicated, but it really isn’t. There are big blocks of color and almost no confetti. As a result it stitches up pretty quickly. I am really happy with how much I have stitched on this piece and am pretty confident I will be able to finish sometime in 2017. 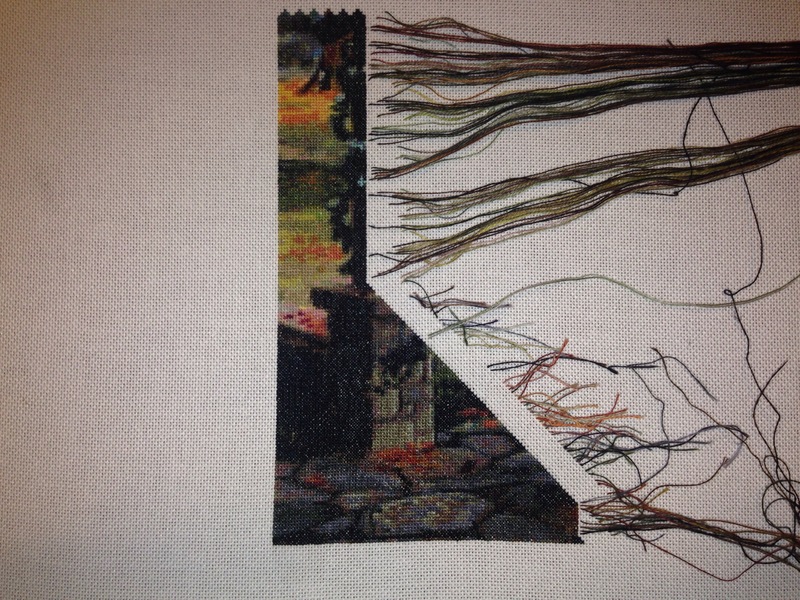 So I have finished the border and am ready to start stitching the rest of the sampler. The border is pretty repetitive and as a result stitches up pretty quickly. There are still specialty stitches that need to be added, but I am saving them for the end. When I work on this I am going to work on the remaining cross stitch, but I am not sure if I am going to work from the top down or from the bottom up. This is quite different from the other pieces that I am working on because it is only stitched in one color. I find that it is a nice change from my other pieces because I don’t need to worry about changing colors all the time–I can just stitch. It has been a really fun experience to work on this. I really enjoy working on this because each motif is small and each can be counted as a small finish of sorts. I love all the different colors and actually had no idea that there were so many shades of green in the DMC line. Each new tree becomes my favorite and I look forward to getting to know more trees as I stitch them. This has been a fun and interesting piece to stitch. However, I didn’t like the autumn bands as much as I liked the spring and summer bands. At this point I think that I am going to wait for all three winter bands to be released before I stitch this again. In addition to all of the projects that are in progress I also finished the stitching on three pieces this year. My first finish of the year happened on January 3. It was Twelve Days, which was a free stitch-along designed by Plum Street Samplers. I stitched most of this piece over Christmas break last year. It was a really fun piece to stitch, mainly because it was so different from anything that I had ever stitched before. I stitched it on 28 count lambswool Jobelan using DMC floss. Here is a picture of the finished piece. This Christmas I have felt a temptation to stitch each of these pieces individually to make them into ornaments. I guess that we’ll see what happens. I really like how this turned out. It was really easy to stitch and only took me twelve days to stitch. I plan on stitching the other three decoys soon. This piece is going to be a gift to my parents for their fiftieth wedding anniversary. I am excited to frame it and give it to them this summer. As of right now, my goal for 2017 is to reduce the number of WIPs that I have. Because of this I don’t have any plans to start anything right now. If I do decide to start anything, it will probably be something small that won’t take a long time to stitch. Of course, my attitude towards all of this might change, but as of right now these are my plans. I am looking forward to having a productive 2017. I have been working on Autumn Magic which is charted be Heaven and Earth Designs and is based on a painting by Randal Spangler. This piece is huge and will take years to complete at the pace that I am stitching. It is also pretty confetti-heavy which helps to slow me down. It is hard to see that I actually made any progress over the last week. However the column at the end of the fence is now almost finished and I also stitches a lot more stones in the walkway. I stitched another oak leaf and four more ivy leaves. I am starting to like how the bottom is looking.